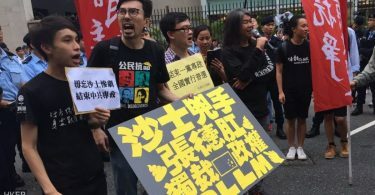 The arrival of Chinese state leader Zhang Dejiang to Hong Kong has prompted cartoonists and members of the public to stage small acts of resistance to his three-day visit. 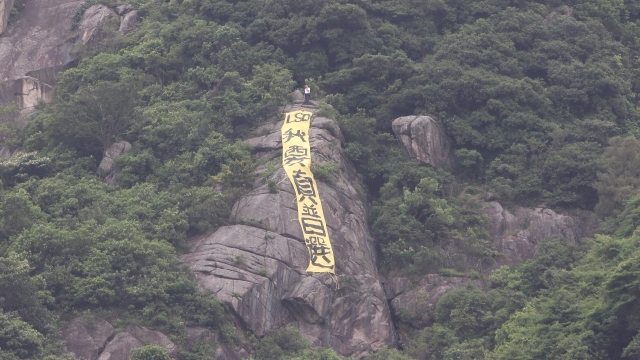 On Tuesday morning, a symbolic yellow “I want genuine universal suffrage” banner appeared near Lion Rock, despite police officers being stationed atop the mountain to prevent such action. 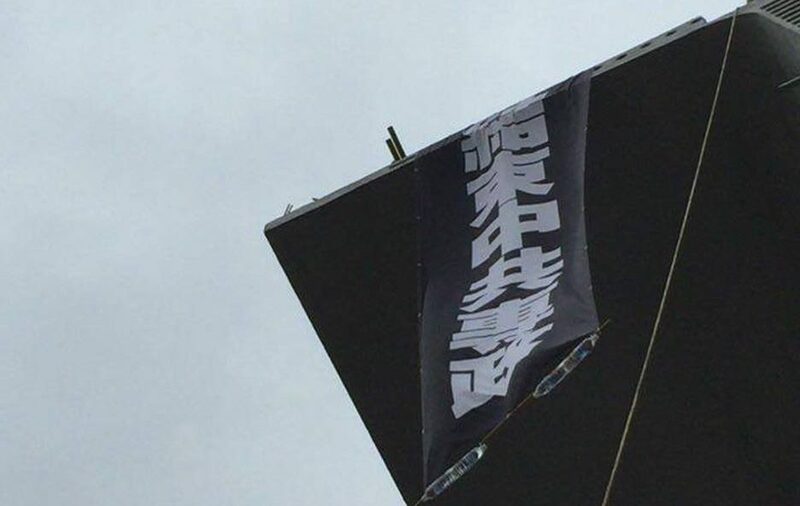 Hours later, a banner calling for “an end to Chinese Communist one-party rule” was hung from a bridge currently under construction on the North Lantau Highway, a road which Zhang was due to pass during his journey from the airport. Artist Ar To drew a four column cartoon apparently reflecting on police efforts to prevent Zhang from spotting protest banners advocating for democracy. Meanwhile, Cuson Lo published a picture apparently showing Chief Executive Leung Chun-ying ordering police officers to take away objects in yellow. The colour yellow is associated with the 2014 pro-democracy Umbrella Movement protests. Designer “Central Saint Student” said that he created a beautiful new logo for the Hong Kong Convention and Exhibition Centre in less than a minute. It consisted of the current logo neatly surrounded by water barricades. Zhang is scheduled to give a keynote speech at the venue for a Belt and Road Initiative Summit hosted by the government on Wednesday. Dozens of water-filled barricades have been deployed around the area as a security measure. Also coinciding with Zhang’s arrival, one citizen placed a slogan on his car. “Zhang Dejiang go to hell, I want genuine universal suffrage” it read. 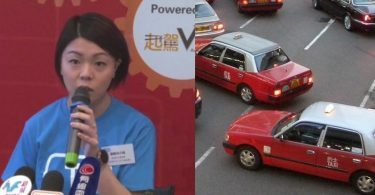 Anthony Lam said that he planned to drive around Hong Kong with it on Tuesday. At the airport, as Zhang arrived, a plain yellow towel belonging to a photographer was reportedly confiscated by airport staff members for a short period. The photographer’s umbrella was also taken away. Both the colour and umbrellas are symbols of the 2014 Occupy protests, though it is unclear whether the photographer had intended to protest. At least three protest marches and rallies have been planned during Zhang’s visit.